Today I had rather grandiose plans to get out before the rain began. I opened the door to a drizzle that is now a heavy drizzle. I chickened out. 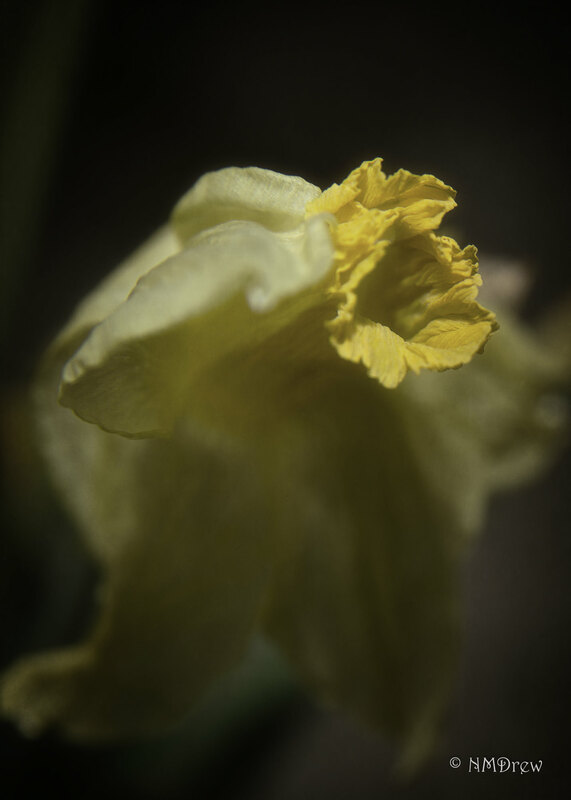 This entry was posted in Glimpses and tagged "photography", daffodil, flower, macro, Nikon 24-85mm f.2.8-4, Nikon Df, yellow. Bookmark the permalink. Haha I would have too. These are fab macros. Just looked out the window . . . rain is 45 degrees to the ground, and rolling in ripples across the road. I cleaned the bathrooms instead! Glad you like the macros. I think macro is what I relate to best, artistically and photographically. A little bit of something, not the whole thing. There is beauty there we see if we look. My view of Zen? Yes I am looking forward to my macro month, flowers especially! Macros are wonderful . . . I used a fill flash with a lot of dampening to keep it very soft. I always forget to use fill flash!